What is happening in Russian society today? What Russians can learn from international and its own experience? And what are the prospects of the ‘colour scenario’ during Russia’s presidential election. In December, Russian and foreign experts were animatedly discussing events in Russia following the country’s parliamentary elections, especially in light of the information campaign launched by the US and the West, which includes the use of political technologies by their ‘agents of influence’ to destabilise society. While respecting the revered colleagues’ right to their own opinion, we should not forget about Russian society's “unique” capacity to move under its own momentum (this inertia applies to both ascending and descending development), and in this sense our country differs from the group of Newly Independent States that fell victim to the destructive spell of ‘colour revolutions’ resultant of the constantly changing alignment of internal socio-political forces. Besides, the conservative dynamic of public opinion in Russia, coupled with an obvious increase in centre-left sentiments in the socioeconomic sphere, leaves ‘the orange revolutionaries’ little chance of bringing their colour projects to life. Russia’s Patriarch Kirill recently outlined a realistic corridor of opportunity for protests. While recognising the people’s sovereign right to express disagreement with election results, he issued a strong warning about the dangers of anarchy and attempts to destabilise society. Recalling the classic expression, "Politics is the art of the possible," I can’t help but think of another quote, more specific though no less aphoristic: “Politics is the art of choosing between the disastrous and the unpalatable,” said John Kenneth Galbraith, one of the leading economists of the twentieth century. Obviously, this relates to Russia more than the United States. In my view, in considering Russia’s political prospects in terms of the global and the Indian experience, we should pay closer attention to the laws of history that shape the development of society in this huge country. What is happening in Russia today is part of global history, and it is happening because our society is losing its quality of “patriarchal identity” and beginning to develop according to certain laws of history. Modern Russian society is diversifying on its own, independently of the authorities; this diversification process also results in the differing interests of the social and professional groups that make up this society. The West also went this way, in its time. Another example is India, with its middle class estimated at 300 million people whose interests are dispersed among a number of political forces/parties. Thus, what we can learn from international experience is simple and clear: diverging economic, social and political interests cannot coexist on one and the same ‘platform,’ that is, within the ruling party (be it the Indian National Congress, China’s Kuomintang, the Communist Party of the Soviet Union or United Russia––the name doesn’t really matter). As events in the Arab world have shown, an important factor in a society’s rapid politicisation is an increase among the youth demographic cohorts of people actively seeking new channels for upward social mobility. Needless to say, during a period of inter-stage transition, a society needs a strong and capable presidential power to offset the relative weakness and underdevelopment of horizontal links in the economy and social and political relations. This is an indisputable necessity, and it cannot be annulled by any “ups” and “downs” in the political situation. 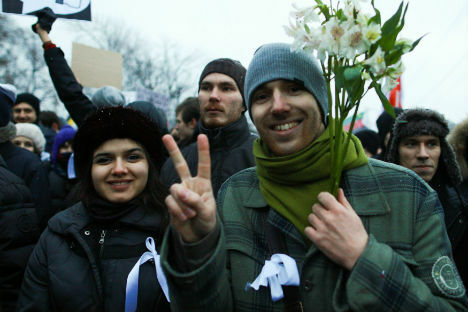 Similarly (and this is where I fully agree with Stephen Cohen, an authoritative American scholar of Russian history), during the transition period, there is also a need for an effective and professional parliament, one of the principle tasks of which is to reimburse the lack of maturity in the emerging social structure of the early 21st- century Russian society. One byproduct of the ‘liberal reforms’ was the self-disorientation of the Russian authorities, which for all these years should have been preoccupied with social engineering – that is, actual socioeconomic reforms strengthening the foundation of state and society – instead of focusing on political technologies. Some of the most active members of the so-called ‘extra-systemic’ opposition should have first recognised (before starting a serious dialogue with society) that the ‘liberal reforms’ were deliberately void of any meaning from the start (goal-setting). In other words, they did not answer the very concrete professional question of how to bring the structure of the Russian economy closer to the economic set-up of advanced countries. Privatisation in itself did not answer and could not have answered such a fundamental question. We should also recognise that we ourselves are to take historical responsibility for the degradation of our economy and society, as many Russians eagerly awaited the ‘second coming’ of the New Economic Policy––that is, the pre-industrial, ‘unique Russian capitalism’ that Perestroika journalism unwittingly idealised. In this respect, I recall talks with India’s leading economists in the early 1990s, remarkable for their inability to understand the strategic goal of the Russian, post-Soviet, reforms. What we saw in the last two decades was in fact the continuous postponement of much needed socioeconomic reforms, largely due to skyrocketing energy prices on the global market. As a result, the delayed development crisis became so acute that the most impatient members of Russian society tried to solve it with the help of ‘street parliaments’ (as similar methods were called in the Philippines in February 1986). However, there is no quick solution to the problems facing our country. There are two basic issues that need to be tackled first and foremost, and this cannot be done in the streets. First, it is necessary to restore the balance of power between the executive and legislative branches according to the principle of counterbalance and mutual coverage, since the 1993 Constitution, which greatly expanded presidential powers, only served to pose new problems instead of solving existing ones. Second, there is an urgent need for the introduction of a coherent and clear socioeconomic strategy that could be easily explained to the people and that would appeal to all major political forces, offering them a chance to participate and obtain material rewards for their modernisation efforts. Such complex problems cannot be solved in the “fresh air”, since this method of conflict resolution might prompt a response in the form of ‘protests against protests,’ as is already happening. Besides, some opposition leaders will have to take responsibility for their part in the destruction of the Russian economy in the ‘era of greed,’ since their reputations are far from perfect in this respect. “And will the US government understand that it would be wise to cease issuing hectoring statements about Russia’s election, and in a step of ethical realism allow the savvy people of a great nation to sort out their own struggles?” asks Katrina vanden Heuvel, publisher of the American liberal magazine The Nation, concluding that the export of colour revolutions has no future. Still, the fact remains that the ‘liberal reforms’ failed to produce any statesmen of a new, post-Soviet type. I presume that if the ‘extra-systemic’ opposition serious about occupying the Kremlin, they should start not by nominating a single candidate for president (rather, that should be the final stage of their political endeavour), but with active participation in creating a mechanism for coordinating interests within Russian society. This path is not going to be easy, and the biggest problem will be making an honest and professional assessment of the ‘Yeltsin era,’ and its role in the economic, political (de-democratisation, as Stephen Cohen calls it) and cultural decline of Russian society. Soon we will see whether the opposition stands the test of political maturity. The so-called Arab Spring prompts a question: what is a ‘colour revolution’ other than the change of people in power assisted by modern political technologies? Another question that arises is whether such a change of ‘scenery’ will satisfy the bulk of the Russian people, who are simply tired of ‘liberal experiments’ and are beginning to step into organised political activity? And there is one more important question: what is the historical subject of Russia’s ‘bourgeois revolution,’ so willingly debated by some of our political scientists? I find it very difficult, even in theory, to view the former Komsomol leaders who benefited from the privatisation of the 1990s, or the Soviet party bosses and top second and third tier officials, with their distinct parasitic/grasping reflexes, as a nascent Russia’s bourgeois class. Today’s post-Soviet ‘bourgeois’ class is an underdeveloped, dependent hybrid, and their cherished political ambition is to once again have Russia as a subordinated and peripheral nation in the global system, as it was under Nicolas II, the last Russian tsar. The trouble, however, is that the world system today ceased to be western-centric, and that ‘manufacturing’ countries in the Asia-Pacific Region acquired the role of “driving forces”, with leading Latin American countries trying to catch up, too. With this realignment of geopolitical actors, Russia may simply drop out of the international economic system and global politics. As recent events have demonstrated convincingly, most Russians are strongly opposed to turning our country into an open air “ethnographic museum”. The West is weakening irreversibly. Hence its desire to retain its global “grip” at any cost, including with the help of political technologies deployed in the colour revolutions. From a historical point of view, colour revolutions are not the brainchild of George Soros (with his shrewd eyes, he quickly sorted things out and lost interest in this venture) but a kind of political and economic project originally intended to alienate part of sovereignty in favour of external centres of influence, accompanied by the ‘plunder of the state’ by certain groups of the new elite and the unrestricted (in fact, pre- and early industrial) exploitation of the country’s natural resources. In Russia, the value of this ‘development model’ has been exhausted, which clearly demonstrates the objective laws of history. The process of overcoming the ‘havoc in our heads’ will make those who call themselves politicians rapidly learn to think in terms of the needs of country and society. It is only then that the specter of colour revolutions in our minds will finally be replaced by the clarity of the laws of history. vanden Heuvel, Katrina. Russia’s Great December Evolution,- The Nation, 12.12.2011. Nayar B.R. The Geopolitics of Globalization: The Consequences for Development. Oxford-New Delhi: Oxford University Press, 2005, pp. 168-180.